In parched California, where water regulations have become stringent, public works departments are starting to map irrigation data to better evaluate water use. The Fontana Public Works Department (FPWD) got a head start in gaining control over its water output thanks to a data hygiene project launched in 2007, when the department decided to take a fresh look at its citywide sprinkler network. 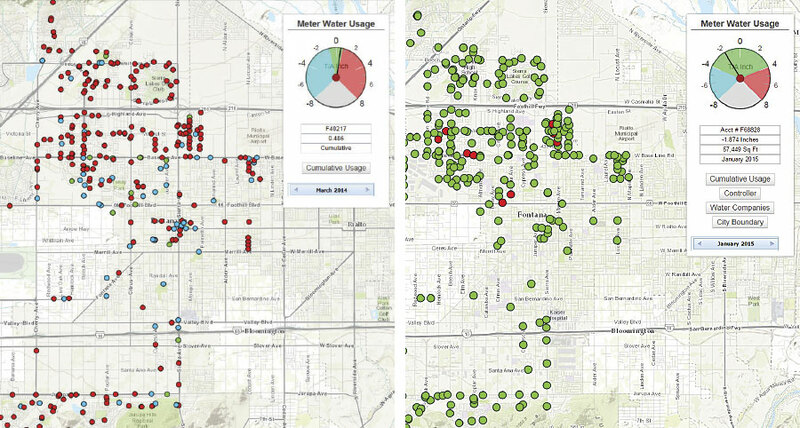 FPWD corrected outdated sprinkler asset information to more accurately map its water use with GIS. Now, meticulous data on irrigation assets and visual representations of water use better inform the city’s irrigation decisions. Conserving civic water output entails knowing every sprinkler’s performance. As Fontana’s irrigation network expanded along with the city’s green spaces, however, changes to city-owned sprinklers weren’t always accurately recorded. With errors accumulating in the database, FPWD found it nearly impossible to get a sound picture of its water use. FPWD’s senior administrative analyst, Rogelio Matta, knew that the city could better understand civic irrigation if the department fixed its foundational information. So FPWD set on a course to improve its data. For eight years, FPWD staff visited all the city’s sprinkler meters, valves, and nozzles to record their associated information. Field staff entered that data into a model in ArcGIS for Server so it could be represented as layers in the department’s maintenance management system, Lucity (an Esri Gold Tier partner), which is built specifically for public works. The department uses Lucity to generate work orders. The program also lets FPWD employees see the entire work history for each piece of the irrigation system on a map, making it easier to keep track of all asset maintenance activity. 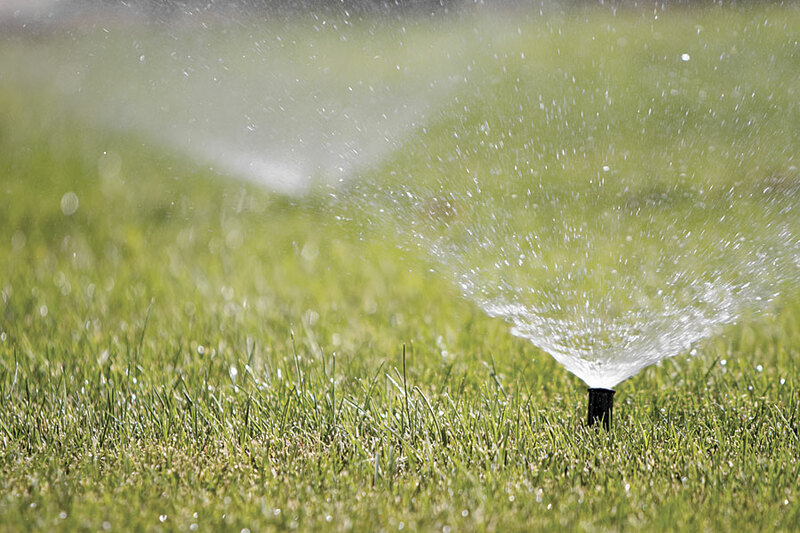 By 2014, FPWD had fixed all its sprinkler data. It now needed to determine the water output from each sprinkler zone to correct any overwatering issues. To determine the amount of water needed for replenishment, the city accessed data from the California Department of Water Resources’ California Irrigation Management Information System, a network of more than 145 automated weather stations in the state, to find the evapotranspiration rate (the rate at which dispensed water evaporates from a given space) for Fontana’s particular climate. Controlling the pieces of the irrigation system to precisely sprinkle Fontana’s greenscape would be key to not overwatering. Thus, FPWD used control devices—such as clocks that tell sprinklers how long to run and weather stations that regulate water output according to the day’s temperature, humidity, and precipitation—to implement smart irrigation. Fontana has 480 automated sprinkler timers throughout the city that communicate with three weather stations. With solid data, FPWD’s GIS administrator, Joe Field, used ArcGIS for Server to map sprinkler information alongside the city’s monthly water usage rate. Now, the department has a map of every civic sprinkler system in Fontana, with different colored dots denoting each sprinkler’s output. Once the Fontana Public Works Department mapped out its sprinkler data, it could see which sprinklers were overwatering (red) and which ones were within budget (green). These two images show sprinkler data from before the mapping project began (left) and after it was completed (right). Field workers with tablets can view the maps of each assigned area and respond accordingly to what the dots tell them. With the live update capability of ArcGIS for Server, staff know that they’re responding to the network’s current condition rather than a situation that has worsened since the last update, which could have been taken weeks or months before. What’s more, FPWD can easily compare its target water budget to actual consumption. Visualization now translates Microsoft Excel tables into actionable information, saving the department water, time, and money—and helping it meet ever-tightening state regulations. Although FPWD is still calculating the total water reduction brought about by mapping its irrigation system, it has saved $200,000. With experts predicting that the California drought will extend into the 2020s, water managers are getting their irrigation data in order. Once the information is cleaned up, GIS can—and does—help public works departments make sense of those datasets.